A year ago today, Anglian Country Inns decided to do something special during our 20th birthday year - raise £20,000 for local charities across our seven establishments in Hertfordshire and Norfolk.From sky dives, tough mudders, quizzes, biking challenges and swimathons the teams at all ACI establishments, rose to the challenge and raised a whopping £21,000. All the staff got involved with some teaming up to walk the 100 mile distance between the pubs, setting off at The Cricketers in Weston Hertfordshire, all the way to the North Norfolk coast ending up at The White Horse in Brancaster Staithe. James Nye, Managing Director ACI says "As a family business with family values, supporting our local communities and local charities is a key part of what we want to do and we are all thrilled with the amount the teams and our amazing customers have managed to raise. It will make a real difference to our local communities on so many levels. All credit must go to the staff at all establishments in the fun and challenging fund raising events they organised and of course you, our customers who supported us all the way." In total, 20 different charities across Herts and Norfolk will benefit from the funds raised, with four in particular benefiting: Garden House Hospice in Letchworth, Herts Young Homeless & Emmaus Norwich (via the STREETSMART initiative) and Macmillan Cancer Support, ACI’s nominated partner for the past year. 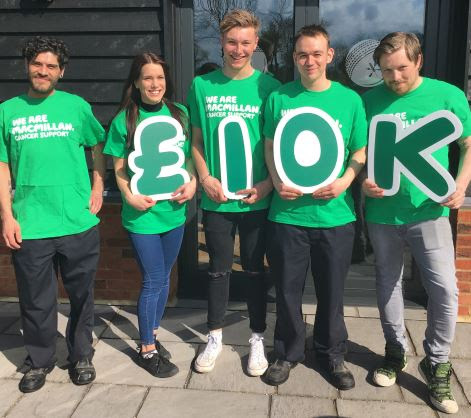 Some of the ACI Charity Leaders who helped raise the £21,000 total with over £10,000 going to Macmillan from challenges including walking the 100 plus miles between The Cricketers in Weston and The White Horse & The Jolly Sailors in Brancaster Staithe.